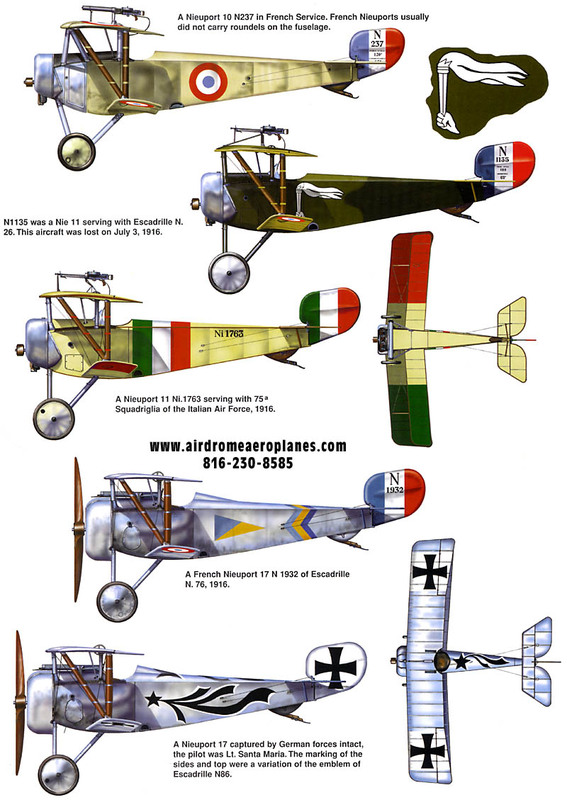 Airdrome Aeroplanes, Rotec powered, Nieuport 28 to Oshkosh and back. "If it flies, it's good. It's just that some are a little better than others." Eustace Bowhay, a 60 years of flying veteran once said that to me while trying to explain his love of flying. I could not have agreed more. Over the years I have flown aircraft ranging from multi engined corporates to the most basic of ultra-lights and they were all good, but some are better than others. When Ray Jarvis asked me to fly his full-scale replica Nieuport 28 from just out of Kansas City to Oshkosh it did not take me long to agree. On the map, at least, it did not look far from Kansas City to Oshkosh. 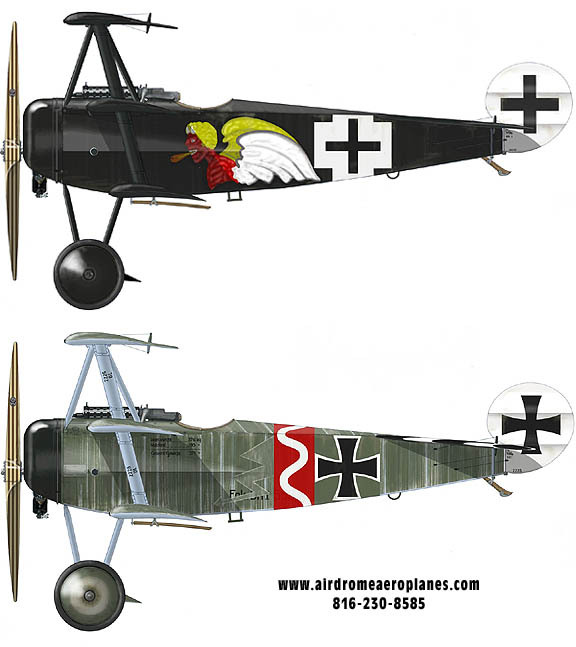 Ray worked with Robert Baslee of Airdrome Aeroplanes fame to put together the N28 in 2005. 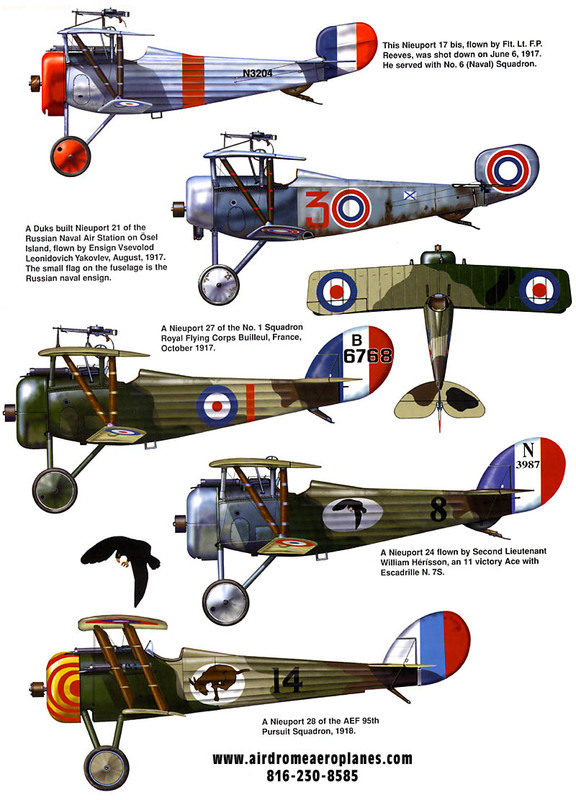 I knew little about the N28 except that Eiddie Rickenbacker, Americas highest scoring WW1 pilot, became an ace in them before moving onto the Spad and Frank Tallman in his book �Flying the Old Planes' (Doubleday1973) certainly had good things to say about them. I had arrived at the Airdrome Aeroplanes factory two days before my planed departure for Oshkosh so was able to get in time looking over the aircraft and also do some preliminary flying before setting off for Mecca, sorry, Oshkosh. I try hard not to approach a new aircraft with any pre-conceived ideas but I do like to get as much information as I can from those more experienced than I am. Ray had warned me that it would get to the ground a little before I would expect it to and Harvey Cleavland, Airdrome Aeroplanes test pilot, spent some time filling me in on the finer points while patiently answering my questions. The Rotec nine cylinder radial sitting in the front of this aircraft, up close, actually looks better than most radials do from a distance. The machining and general finish of these engines needs to be seen to be fully appreciated � I can now report that they run as sweetly as they look. Most pilots today have not had the pleasure of flying behind a radial engine so some education is needed to make sure no inadvertent problems are initiated by a pilots lack of knowledge. The Rotec may be a modern radial but the old laws of physics still apply, so before starting, it is imperative to pull through the engine to clear the lower cylinders of oil and avoid the possibility of a hydraulic lock. Getting in and out of the N28 takes a little more thought than trying on your average Cessna, but once in and standing on the aluminum seat, it is relatively easy to slide into position. The wood grain dash, in this aircraft, is set up to replicate an original N28 with attractive gold rimed instruments. A sight fuel gage is tastefully set in between the instruments. The starter button is on the right of the two ignition switches on the lower right of the dash while the throttle, choke and carburetor heat controls are comfortably situated on the left side of the cockpit. Having already cleared the engine ready to start, and checked that all is clear I pressed the starter allowing the engine to turn through a few rotations prior to flicking the ignition switches on. Unlike some radials the Rotec starts so easily and smoothly that it's actually a pleasant surprise to hear it catch as soon as the ignition is turned on. There is a distinct radial sound although it is so quiet and smooth you need to listen closely to hear it well. Cooling is certainly not a problem with this instillation, the oil pressure rises almost instantly but it takes longer than anticipated for the oil temp to rise to the safe operating range. Taxying is as you would expect an aircraft of this vintage to be although having no breaks just reinforces how well off we are today compared to flying in the early 20th century. I only had to shut down once to avoid going where I had not intended to. Like so many of its pears the N28 has a higher centre of gravity which manifests its self by a gentle swaying from side to side as you taxi, this is hardly noticeable when operating on grass but became obvious on concrete or blacktop, especially with fuel in the top wing tank. Having spent so much time in various RVs it is a little disconcerting not being able to see forward with out the obligatory �S' turns, complacency is not an option. Once lined up on the runway, easing the throttle forward and raising the tail is almost a simultaneous operation. When the tail is up forward visibility is no longer an issue. The takeoff roll is short, about five to seven seconds and less than 100'. Some rudder input is needed but not more than expected. Having said that; the aircraft will quite happily fly out of balance, so like all other early aircraft, the pilot needs to keep a good eye on the skid ball to keep it centered. Overall there were no surprises, the aircraft flies and handles very well. The stall is very docile only dropping the nose when the pilot insists on holding the stick back well after level flight can no longer be maintained. Even then the drop was not at all violent or surprising in any way. Approaching to land is no more difficult than any other aircraft until you get to the very short final position. Once the nose gets high enough to block the forward view you need to use your peripheral vision while looking from side to side to keep it straight. My first few landings were as it should be, on a grass strip, they were safe but not as straight as I would have liked. The landing roll is surprisingly short for an aircraft without breaks and was not at all the problem that I had anticipated. Ray was right; the gear arrived on the ground about six to twelve inches before I expected it to, but this too was not a problem. After a few more circuits I was feeling comfortable enough to face the flight to Oshkosh. Being the first to land this aircraft on blacktop, I approached the landing with extra care. I was about half way to Oshkosh and of course there were a few knots of cross wind, just to add interest. Touchdown was normal but directional control needed to be maintained with more vigilance than on grass. It was about then that I noticed the rolling movement from the higher centre of gravity. As the aircraft slowed and the tail was sinking, a small gust of wind picked up the into wind wing giving an immediate swing and that unpleasant feeling of not quite being in control, the rudder did not seem to be effective as I was hoping so I tried a bit of aileron. Just like a stately old lady the wing came back down and we again headed in the right direction. This was not what I expected but on two other occasions on hard top the aircraft did the same and each time responded nicely to aileron input. The flight to Oshkosh took seven hours. Initially it was just like so many open cockpit filers dream of, the wind in your face the smells of country mingled with aircraft smells and the general joy of early morning flying. As the day grew older the aluminum seat got harder. It was still a real pleasure watching the wonderful middle American scenery pass by but by the time I landed at Oshkosh more of my attention was focused on relieving the backside pressure than enjoying the flying. After a very enjoyable week and a couple of in flight photo sessions with the EAA photo team, the return journey was not approached with near the enthusiasm as the flight there had been. A late start due to weather saw the return flight broken in two, but the much appreciated cushion still was not good enough to fully solve the numb backside problem. On the last leg home it was as if nature had decided to extend the flight for me. A ground speed of 36 knots does not inspire you to take up flying for the speed. Despite this, the N28 rode through the turbulent air with ease. Even the fairly turbulent approach onto the short grass strip at the Airdrome Aeroplanes factory was gentler on this pilot than expected. I guess there was just a touch of pride when Rob said "that's got to be the strongest crosswind this aircraft has ever seen." 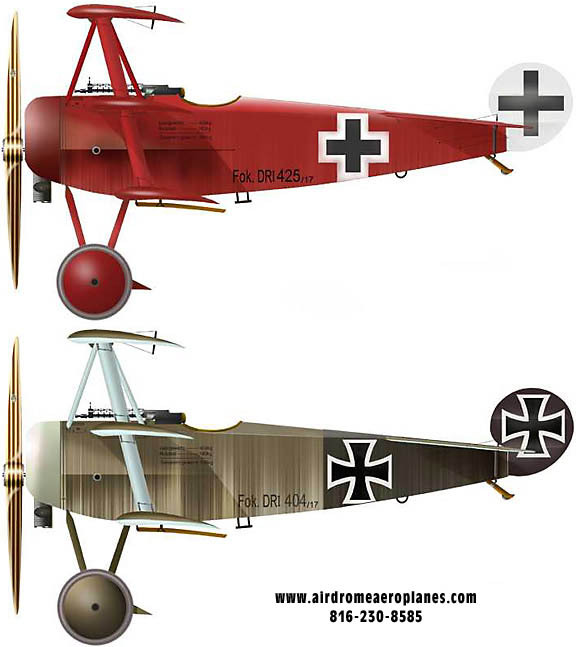 As Airdrome Aeroplanes prototype N28 replica, this aircraft is still being refined. Rob would like the overall performance to be a little closer to the original so, as is typical of Rob, he is working with Ray to achieve this goal. I am sure that it will not be long before this N28, and many others like it, will be out on the dawn patrol with a pilot dreaming of emulating Eddie Rickenbacker's feats or maybe just soaking up the joy of flying one of histories great aircraft.